This is a simple recipe, simply prepared with simple ingredients – with a wonderfully simple but delicious taste. you know, so many of the best dishes are that way. They don’t need to be complicated or over thought in order to be delicious. I’ve convinced that most of life is meant to be that way as well – simple. Yet, we manage to overcomplicate it every single day. We can take something that is meant to be a line drawing and complicate it to the point of being a Monet. There is a video on Youtube….Don’t worry, it’s not cute kittens or puppies doing tricks. My daughter loves those and I’ve had to sit through entire days of cute kitten videos (I’m being totally serious). They are cute and all that and I love kittens but I’m no longer in my pink puffy clouds and unicorn phase of life so when Katy Rose calls for a marathon, I come up with excuses to clean the house and cook things for her to keep her strength up as it goes into the third hour. This video I’m taking about today is Youtube gold and I dearly love the woman in it. Apparently, it is about a year or so old but, being out of the loop as I am, I am just now seeing it. That’s my favorite line for 2013. Ain’t nobody got time for that. As simple as it can be and it says so much. Some folks look at the musical version and think it’s making fun of her, I watch that video like she’s a preacher and I’m the congregation. Preach it, Sweet Brown! Think about all of the other options available to her. She could have just stood there and whined. She could have had her kids try to help her over each day. But she didn’t have time for that. She had kids who were tired and hungry and she still had to prepare and cook supper for all of them. So she just fell over the fence and kept on going. He laughed at me too, but let me come in and stitched me up on his lunch hour. I had to put on a baseball cap and tuck all of my red stained hair up in it as I drove myself down there so I wouldn’t freak out people in traffic. I got my stitches, wore my baseball cap back home, took a shower real quick before the numbness wore off, dried and curled my hair, reapplied my makeup, cleaned up the stains from my carpet and washed the towels I’d used to try to stop it from bleeding. Then, drove to pick up the kids from school and came home to cook supper. I’d lost valuable work time taking care of that nonsense. I had other options that day. I could have laid down and cried and called folks and told them I had a profusely bleeding head wound. I could have even called 911 and had them send an ambulance for me. I’m sure ambulances go for lesser things. I could have called up my husband and made him miss a good day of work, too, to take me to the hospital. You really don’t want to go to the hospital around here unless you have a good bit of your life to dedicate to it. I think the wait is their version of triage. They figure the only folks who are serious are the ones willing to wait 8 hours, so they decide to see you at that point. I had kids to pick up from school and supper to cook and a mess to clean up and work still left to do. I didn’t have time for that. The main thing, though, is that I was perfectly capable of taking care of it myself, so there was no reason to pull other’s away from what they were doing or cause a stir. You know, it’s that inner drill sergeant of mine. The one I installed in my brain. It’s all in the way I talk to myself. I’ve struggled with gravely deep depression in my life. Since I clawed my way out of that black pit, I’ve spent every day since making sure I don’t go back. I’m like a recovering alcoholic who won’t allow themselves to be around alcohol. I won’t listen to certain music, I won’t watch certain tv shows, I won’t even read certain books or articles. I keep my head high and my thoughts on things worthwhile. We don’t dedicate a day to being miserable. We don’t do a series of posts on Facebook about it. We don’t call up Mama and Daddy and cry over the phone. So you’re tired, but there is a fence in front of you and you’ve got hungry kids. You can climb over it or you can fall over it, but it’s a fence that has to be gotten over one way or another. Well, you need stitches. You’d best just accept it and get them so you can get back here and clean up this mess. So life is hard. You can whine or you can stand up straighter and start conquering it. I decided several years back that as long I’ve got a life to live, you won’t find me laid out on the fainting couch. 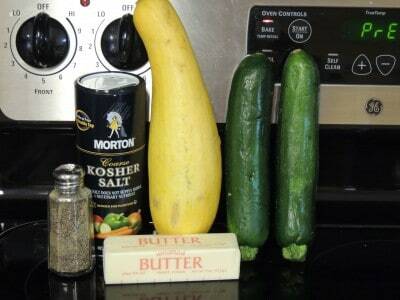 You’ll need: Yellow Squash, Zucchinni, butter*, salt, and pepper. *You can use 1/2 cup water in place of butter if you like. The butter does add a nice flavor hint but the veggies also taste wonderful on their own. Place butter or water in large skillet over medium high heat. I always eat a few slices raw because you know, cooking is hard work and you’ve got to keep your strength up! Add veggies to skillet and cook over medium heat, stirring every few minutes, until veggies become translucent, about 8-10 minutes. You don’t want them so cooked that they cry uncle, but just enough to make them tender. Remove to bowl or platter. Sprinkle with salt and pepper according to your taste, and serve. 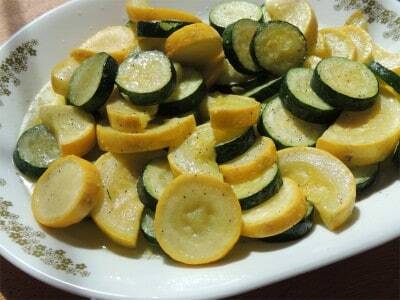 This side dish is simple and clean tasting and goes really well with pretty much anything. 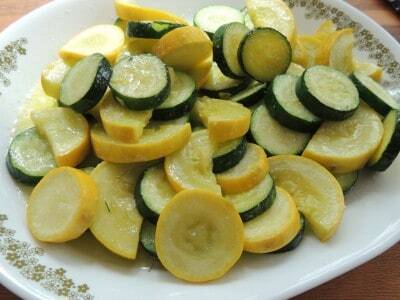 You can serve this as is or add in other vegetables while it cooks, too! Try adding onions, tomatoes, thin sliced carrots, or anything else you have on hand! 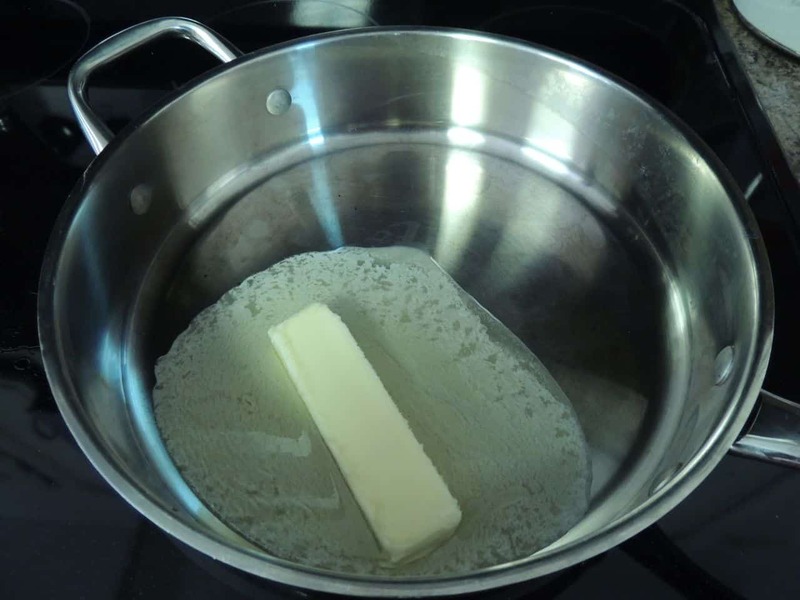 Place butter or water in large skillet over medium high heat. 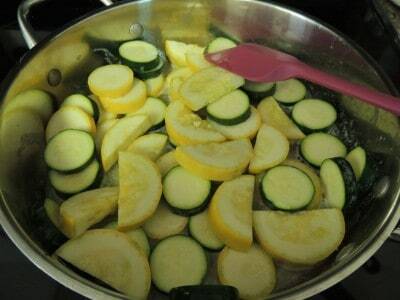 Slice vegetables and add to pan once butter is melted. Cook over medium high heat, stirring every few minutes, until veggies become translucent, about 8-10 minutes. Remove to bowl or platter. Sprinkle with salt and pepper to taste. Serve warm. Submitted by Jenny. Click here to read more wonderful quotes and submit yours, too. 35 Ground Beef Recipes to stretch your Food Dollar! Wonderful message here, it’s just too bad there are people who would never use the advise. Also there are people who need more than just a good pep talk to get them to get up and move. Then there are those even with meds and a pep talk will not ever move. Love the recipe, I add my seasoning while cooking is the only difference. Keep up the great work. You make the day for a lot of us. Hey Kay! I had to type your name three times to keep from putting a “T” in it! lol My daughter’s name is Katy so Kay naturally types out that way for me 🙂 You are so right. Sometimes people DEFINITELY need more than a pep talk, they need medical help and that is nothing to be ashamed of. But then again as you said, sometimes they just have the will to stay down, too. It’s tragic but there is a purpose and reason for everything, I know. You are so sweet and I’m so thrilled you took time to chat with me today, made the sun shine a little brighter in my corner of the world! You nailed it again, Christy!! Love it! Thanks for sharing Sweet Brown’s video. I’ll be playing that a LOT!! I’m wondering…was she going out for a cold diet Dr Pepper, by chance? I like to THINK so!! 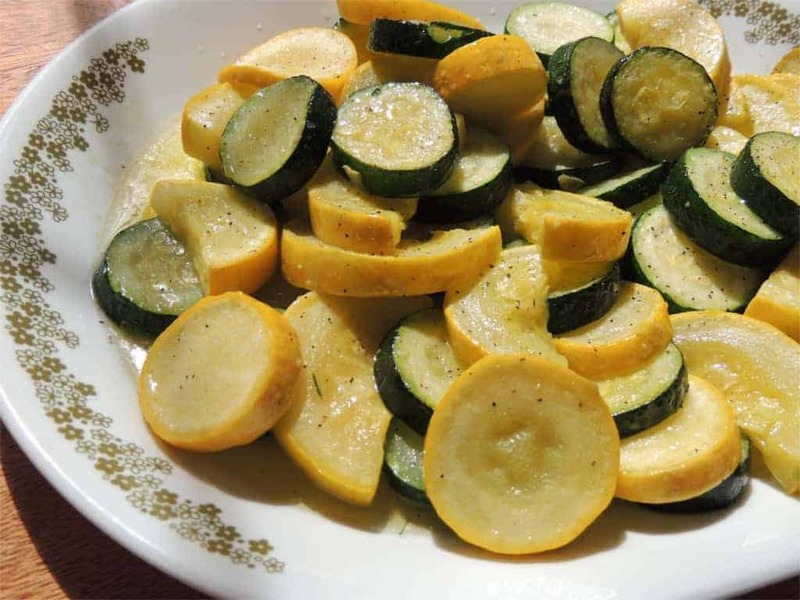 I’m so in the mood for some squash cooked up this way I love how your squashes stood up all ‘Veggie Tales’ like, too! Thanks for another great story/lesson post. Debbie, I was going to say the same thing bout the VeggieTales veggies! simple is the way to go cuz ain’t nobody got time for that! I love this dish – sometimes I’ll add chopped onion, mushrooms, and use a little olive oil. Sometimes I use chicken broth to simmer, and have even added diced tomatoes. On a side note: my dad, who will be 88 this month, makes pimento cheese (and he does a really fine job, too). He gave me a container this past weekend. Not because of pimento cheese, but just because; I remind myself each day how fortunate I am to have a father to love, visit and even share simple traditional treats! You only just discovered Sweet Brown?! It’s so funny you write about this and the ‘remix’ they made because as I was walking out from work today in the rain (first of the season!) I was singing the song in my head. Haha It makes me laugh so much. If you’re ever up Kansas way, would you stop in and visit? I just love your posts!!! I loved the story of Sweet Brown! How I needed to be reminded that there are a lot of things in life that I just “aint got time for”! Thank you also for the quote by Shel Silverstein. I had never read that & it holds a precious message that I’m going to share with my kids! Have a blessed day, Christy! i loved this article. you should really consider having a separate blog just about life experiences. you write about them in a way that it is easy to connect with you. i actually get excited when i see you’ve written a long article with your recipes. unless you ain’t got time for that(lol). I love your outlook on life. I make this with a squeeze of lemon at the end. It adds a great flavor to a simple dish (I use less butter, or sometimes 1/2 butter 1/2 olive oil). Simple for my veggies is the way I like to go. I got time for that! I think I will try this but use coconut oil! 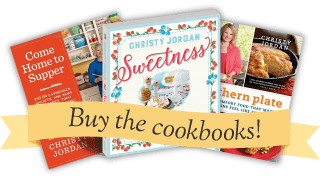 Thank you for adding easy healthy recipes….keep them coming! I have many a times put off going to the Doctor for me cause I don’t have time for that! To have to tell them I have had this problem for several months and have just now had the time to come and see them about it. When I make appts for myself… I have one day of the week that is usually set aside for getting things done for me… Not everyone is so understanding… then I just say hey look with 6 kiddos at home (back in Novemeber- it was a Family member at home with in home hospice) you have to work with me… I have too many things to do to be trying to work around your schedule if they think it is important then they work with me…otherwise they might have to wait 6 months or longer… I love your posts…So very glad you got those stitches and we love squash around this here house. Ha my family says “Ain’t got no time for that!”, about everything these days. They really are good words to remember. Amazing recipe too. 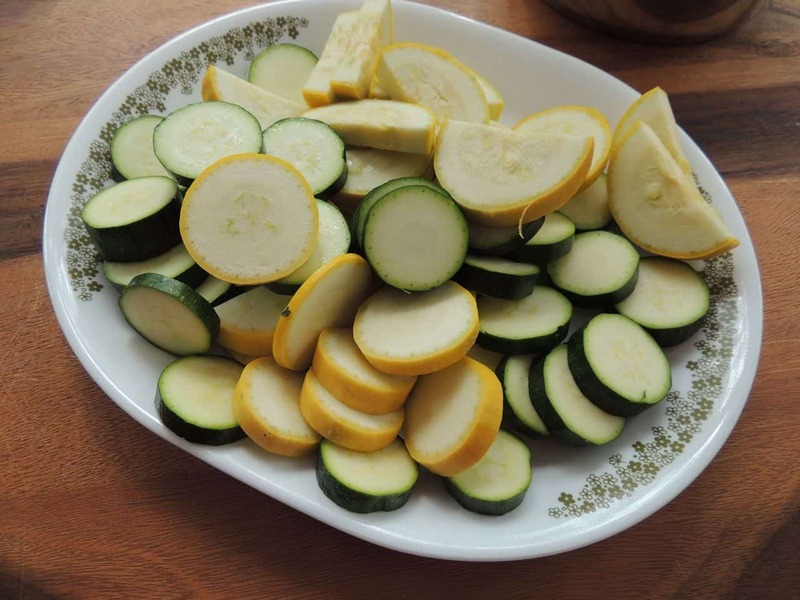 I’ve been doing something similar with zucchini for a couple years. Zucchini is possibly the best vegetable ever. Thank you for the recipe! And another Amen for good measure. Actually . . . from a book of my childhood, O Ye Jigs and Juleps: Hallelujah, hallelujah, hallelujah, glory three times also and amen twice. Love, love, love this post! Plus it also has my favorite vegatable! I love my squash cooked this way – plain & simple!!! I’m watching my calories and I can eat a boatload of this!!!! Also, I think that lady on the you tube is a hoot. I’d like to sit down a spell with her too!!! I always love your perspective on things. Hope you have a wonderful day because you always make mine great!!!!! Hey, Christy! That first pic with the squash standing up straight and tall tells me we both watch a little too much “Veggie Tales”! And thanks for all the drill sargeant encouragement today. OUCH!! I am sick today… running a fever and such… but, there is so much housework to be done. Griping and complaining, I went to vacuum the downstairs. While going down the stairs, the vacuum comes apart and a months worth of dog hair and wood ash goes flying everywhere! I busted the filter, so that when I turned it on to clean everything up, it shoots ash everywhere! I lost it! I called my husband crying and started blaming him… like he was even here. (Please remember I am sick and running a fever… that’s my story and I’m sticking to it! LOL!) Soooo, long story short, this is one fence I didn’t fall over… I think I let it fall on me! LOL! I will keep this in mind for the next fence I come to… for now, I am going to fall over the bed! :o) Thanks for the good swift kick in the pants! By the way, the recipe looks yummy! Can’t wait to try it when I feel better. How about slicing the veggies, sprinkling on some parmesan cheese and microwaving for 5 minutes. It’s like dessert! I always love your messages and, of course, the recipes! I feel the need to add something here, and I hope everyone reading this will understand what I am trying to say. There are times in our lives that we are forced to stop…dead in our tracks … and accept help and even lean on others! I am 63 yrs of age, have raised 4 children, and now have 5 “grands”! I pride myself on “falling over that fence” many a time and doing whatever was necessary for my family. I’ve taken care of my husband and family for 43 years now! However, my life changed drastically about 6 months ago. I am battling cancer and I had major surgery a few months ago. I have learned to let go of a certain amount of my “stubborn ” nature and allow my family to do some things for me! It has not been easy! I am accustomed to doing it all and serving others…esp in the kitchen! Ha! It was not a matter of lack of will or taking to my bed… it was a matter of survival. I want to be in control, as most of us do, but the situation has forced me to bend… bend, but not break! Cancer has knocked me down, but not out! hospital, having blood drawn and having scans of my body. I have to accept this in order to have a chance to live… It would do no good to resent the time this takes from my day. I long for my “old life”, prior to cancer, but this is my current reality! I do not whine about it, but I have my “down” times… and one of my daughters is usually there to give me a hug! Sorry this is so long, but I felt the need to share my story and express my opinion that we sometimes are forced to let go…for our own good. Thanks for letting me have my soap box today! Amen Wanda! Without God’s grace, I have no idea how I’d be able to put one foot in front of the other on any given day. Bless you and please know that you are in my prayers. Thank you for sharing your soap box with us today! I’ve made this recipe for years, but it’s been awhile since I made it last. When I do make it, I add alot more black pepper and pile on some parmesan cheese. It’s sooo good! Thanks Christy. You are my hero. I had a grandmother like that. She grew up in rural LA and did the same thing. She had her babies at home and cooked supper the same day. She worked as a janitor to make ends meet after my papaw died and cleaned houses at night and on the weekend, and still had a full sized garden for food. I had forgotten of all she was able to do and how I bemoan dusting because it makes me sneeze. Thank you for sharing your can do attitude and reminding me I come from very strong stock and can do anything. I admire you for pulling yourself out of that pit of depression and being who you are EVERY DAY. I struggle with depression most of the time—some days are better than others. I look at folks like you and hope to be like that. Thanks for the tidbit of that testimony. I’d love to hear it all someday…it gives the rest of us hope and courage. God bless. Christy, great post! You remind me of myself as far as “don’t be whining…get up and do something about it!” LOL So happy I signed up to your site! Am fixing to try out your recipes. I have made the Canyon Casserole, and we all loved it! Also made the TexMex lasagna…very good! Want to try your “cornbread omelets next. Hope you have a beautiful day! Love your words of wisdom today. I’m a firm believer in looking on the bright side. There are so many things in life we can let drag us down. Doesn’t serve any purpose to wallow in it. I’m all for counting blessings and thanking God He let me wake up today. I love to cook my squash and zucchini in olive oil and add sliced onions. Besides being good for you vegetables they are usually priced very reasonably too. Some years we grow our own. Last year though the deer decided to mow our plants down….so guess we’ll just buy at Kroger from now on. Glad they didn’t find our tomatoes and peppers. But the wildlife have to eat too. This reminded me that I knew how to cook before finding southernplate.com =) I love to get the veggies from the farmer’s market or glean from someone’s home garden. I use yellow squash, “green squash”, and onion. Great video! Poor woman! But she’s a survivor, she’ll be allright. Your story reminded me of my grandmother. We asked her once when she had menopause. She said she was too busy to be bothered with that. She didn’t remember when it happened. My sil cooked squash and zucchini as a side dish on a camping trip last year. She cooked it on olive oil and added big chunks of onion. Delicious. Of course most things taste better cooked outside.